The opera exploration journey this year has brought me to know several masterpieces from classical heritage which are not part of the popular “go-to” list, including Arrigo Boito and “Mephistophele”, Frommenthal Halevy and “La Juive”, and now also Giacomo Meyerbeer and “Les Huguenots”. Until now I have heard several arias, and when Deutsche Oper Berlin announced new season and premiere of “Les Huguenots” with Juan Diego Florez, I booked the ticket immediately. Not much preparations have been done from my side before that performance, except reading synopsis and information on the company’s website, thus being open minded and ready for full immersion into the experience. The performance was fully sold out, there were some people offering a spare ticket, and some who were looking for one, and the second performance in the run was packed with typical Berlin opera goers crowd, predominantly grey-haired. The show started with a disappointment as when anyone appears on the stage before a start of the performance, he usually brings bad news. The announcement in German was relatively extensive, but my limited knowledge deciphered that despite being ill Juan Diego Florez decided to sing and asks for our understanding for his limited ability. With a painful groan the audience absorbed the bad news and to refocus then cheered enthusiastically appearance of Michele Mariotti at the pit. The night turned out to be outstanding: total of 5 hours of sublime musical journey masterfully led by brilliant conductor, the production that was a feast for the eyes and ears, and suspense level that keeps you on the edge of the seat till last minute of the show – even difficult to remember similar overwhelming experience. It is obvious why Les Huguenots are a rare find nowadays – it requires smart stage direction and an outstanding cast, assembling at least 7 top notch singers with extraordinary acting capability. The highest praise for Deutsche Oper Berlin being able to deliver on both accounts impeccably! Production by David Alden is relatively minimalist, not overcrowded by symbols and props, the costumes provide unmissable hints on the intent, the set design, even if a bit confusing in the Act 1, tells the story louder than words. The musical score has rich and interesting orchestration, providing solo opportunities to various instruments – from viola to oboes, and creating the impression that human voice is part of that versatile orchestra. A lot of weight is carried by a chorus, both on acting and vocal delivery side, thus providing ongoing dynamics. The characters are well developed and dynamically evolving through all 5 acts, thus adding to the plot psychological layers. It is worth to mention that overtitles provided in both German and English is of great help to follow the plot in detail, and is relatively rare find anywhere else in Germany. The selection of the particular opera did not seem like intentionally positioned message from the opera company, but in light of all recent events globally the topicality of the problems discussed are of utmost importance. The main protagonists are forced to decide among love, faith and duty; the crowds are moved in the name of God and people are challenged and drawn into unthinkable actions using their faith and loyalty. The sound of the bell should wake up all of us and force to examine the stance we have taken either pro or contra on the most decisive topics leading to the future of the civilisation – or we all will perish regardless of the side taken. As mentioned before, the cast assembled by DOB is outstanding – and again there are a few new names I need to include in the “to follow” list for future planning. The star of the night obviously was Juan Diego Florez, but my favourite unconditionally was Ante Jerkunica as Marcel – have seen and heard him before several times, but last night was exceptional. Patrizia Ciofi as Marguerite de Valois, Marc Barrard as Le Comte de Nevers, Derek Welton as Le Comte de Saint-Bris, and especially two young ladies Olesya Golovneva as Valentine and Irene Roberts as Urbain created the ensemble that ensured great theatrical experience. At first, Juan Diego Flórez did not show any obvious signs of being indisposed as his part during Act 1 did not require any heroic voluminous top note delivery. I had a suspicion that his voice lacks some ringing brightness that is so characteristic to his unique tone, but even that might have been perceived based on the information provided by management. Some signs of fighting through the night came during act 2 and later when it was obvious that top notes had to be forced and at much lower volume, projecting into the auditorium like a bit muffled, and his fight with sinus fluid was noticeable. 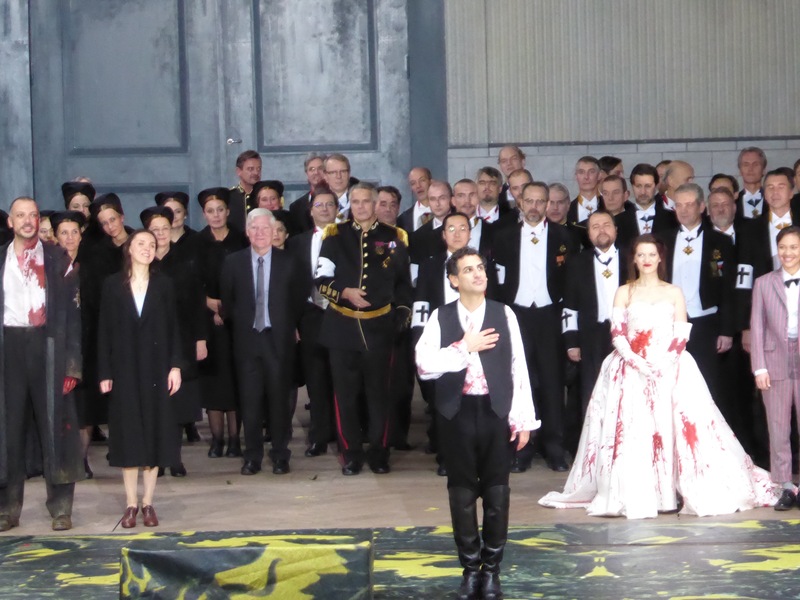 Nevertheless, Juan Diego Flórez delivered stable, convincing singing and acting, and his cautious participation in ensemble parts were not hurting the performance. Last night Ante Jerkunica as Marcel delivered outstanding performance. This is one of the rare bass roles that gives an opportunity to demonstrate a full range of the vocal capabilities and requires advanced acting, and he delivered an intense portrayal of wholesome personality comprised from devoted believer, loyal servant, heroic warrior and protecting guardian. Olesya Golovneva as Valentine was a new name for me, very surprised on vocal skill and maturity, bright clear top ņote combined with great dramatic acting potential. Irene Roberts as Urbain was so convincing as a page, that initially it was hard to believe you see mezzo on the stage – when her voice was fully let to soar it was pleasant discovery and certainly her future performances are worth to watch out. 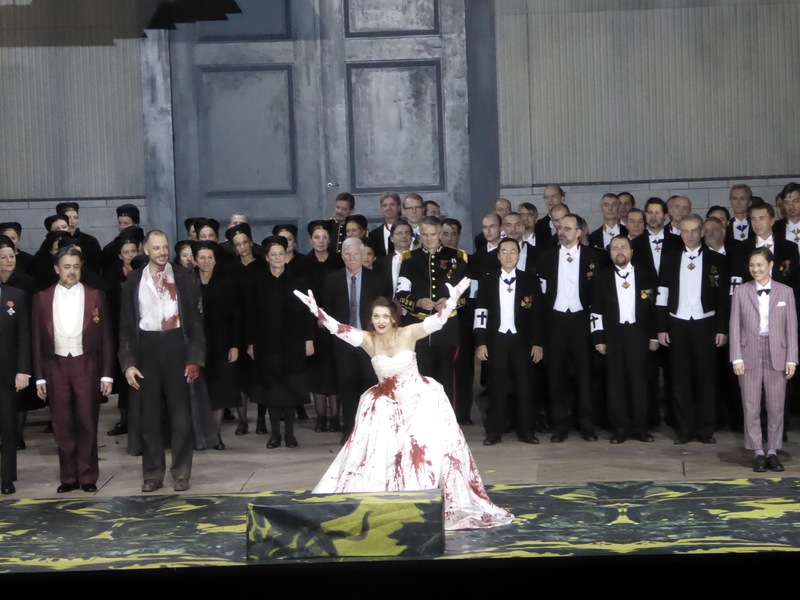 Patrizia Ciofi as Marguerite was a bit uneven in the beginning but warmed up nicely, this was a pity that her part was dominating only in Act 2, providing more acting and appearing scenes rather that vocal involvement later on. 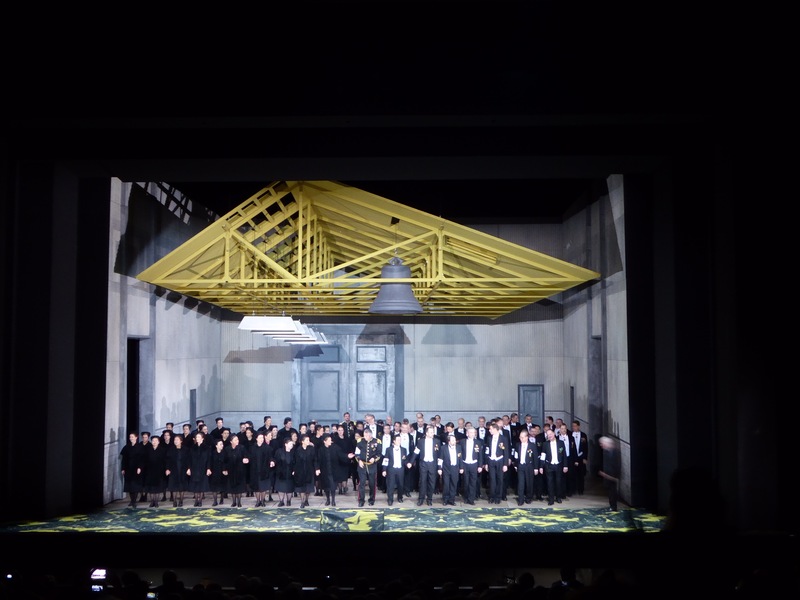 Chorus played a crucial role as one of the main protagonists, supported by ballet well in several scenes thus keeping high dramatic dynamics throughout the performance. Obviously this was the performance a “must see” of the season, pity that the run is relatively short, but hopefully it will be renewed next season. Looking out for more productions in Meyerbeer cycle!